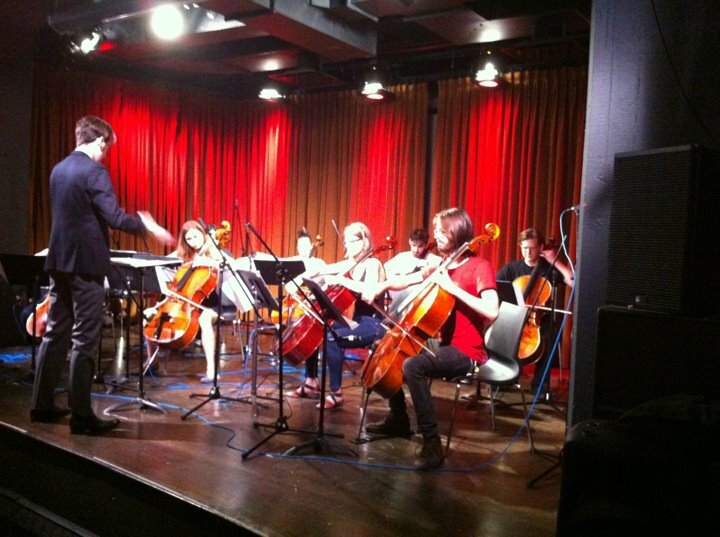 W4 New Music, a team of young composers fresh out of NYU, brought their Kickstarted Cellophilia production to the main stage of 92Y TriBeCa for a delightfully large crowd. Interested in curating themed shows full of newly composed pieces, the team chose the many faces of the cello as their topic of the night. With nine tunes on the program spanning nearly two hours, the show gave us a wonderfully diverse “how-to” on the cello as it explored different ensemble sizes (from one to eight), staging possibilities (on the stage and surrounding the audience), electronic integrations, and aesthetic possibilities of one of the most tried and true instruments of the Western music canon. Mariel Roberts opened the show with a signature cello sound–an articulate double-stop–that initiated a spirited momentum that would carry through the first of the show’s three segments. Roberts handled Sarah Kirkland Snider’s “The Reserved, The Reticent” with hardly a reservation. Her rhythmic swipes dug deep into the strings, and commanded the instrument’s full range all at once. The energy relinquished in volume but never intensity as the piece moved to a conversational middle section, where the melody was glided between pizzicato and bowed statements. The opening double-stop was resounded in the concluding moments and served as the basis for a dramatically executed final statement. Roberts was then joined by the full brigade of cellists, seven in all, to back up composer Brooke Campbell as she sang her own “Ice Covers the North”. Fellow W4 composer Matt Frey conducted the dual-choir opening, using his arms like faders on a mixer, fading one chord out as he raised the intensity of the next, creating lush gusts of sound. As Campbell began to sing over this organic texture, the cellists’ role transitioned from free-verse soundscape to a metered accompaniment in a pop tonality. Campbell’s voice was crystalline and honestly emotional, but the performance felt delicate. I would have loved to hear her push the dynamics and belt it out–the piece had the structural integrity withstand a bigger growth and the cellists certainly would have followed her lead – but even in it’s reserved state it was a highlight of the evening. The show’s first segment concluded with John Zorn’s frenetically virtuosic trio, “777 (nothing is true, everything is permitted)”. Well conscious of his title, Zorn’s score called for just about every sound I could imagine a cello making. The pacing was vivacious–Ashley Bathgate, Mariel Roberts, and Brian Snow dug fingers and bows alike into their strings, creating a torrent of audacious articulations and portamenteaus. Passages of pandemonium were split up with momentary bouts of silence and long unison rhythms before resuming their bedlam – brief and sudden spaces reminiscent of the bullet-time slow motion scenes made famous by The Matrix. The moment that made this performance mind-blowing was when it occurred to me that despite the outward feeling that the cellists were moving with individual rhythmic liberty, instances of two-to-one or three-to-two counterpoint subtly pervaded the texture, assuring that every single gliss, pluck and tap were dead-on: this ensemble was a fully-synced autonomous machine. The intermission (first of two) that followed the “777” was long, but the audience seemed to welcome an opportunity to catch their breath from the first segment’s action. The music resumed with a bustling cello duo, highly reminiscent of dutch composer Jacob TV. In “Empty City”, Yoav Shemesh’s electronic track built grooves with a battery of glitch beats and stuttered voice samples. His hip, darting-fast aesthetic layered thicker than Jacob TV’s usual (who tends to reach only a cursory pop groove, and relies on his piece’s topic or theme to propel it from there), and gave the piece the tight quality of a mash-up DJ, but with a meticulously composed structure. The cellos, who reinforced the grooves but felt more like the accompaniment than the soloists, were buried by the volume of electronics. When working with electronics and acoustic instruments, there is always a battle with blending the sounds of the two worlds – and it’s a different solution in every space. The main stage of 92Y Tribeca had a sound system that covered the house corner-to-corner, but an acoustic instrument, even the boisterous cello, is inherently not going to disperse as evenly. I would love to hear this piece again with the cellos using pick-ups, putting their sound through the same speakers that carried the electronic jams. In a concert all about using the cello in different ways, I was happy to have been encircled by the ensemble; 360º sound has such a wonderful potential for immersing the audience in an environment. Matt Frey’s “Canon Prelude” made fine use of the dimensional aspect of this set-up, but the pizzicato canon upon which the piece was based felt sparse and developed slowly. There were several defining moments where stereophonic arco swells rose over the pizz canon, but the score that could have capitalized on a very proficient ensemble in a very potent staging seemed to stop short of transporting us to that synesthetic world. Robert Karpay’s Three Programmatic Duos sought to explore human personality disorders with each movement. The program excluded those particular disorders upon which he was programmatically writing, which left me guessing at what each movement was really about. I felt a little alienated because of this; I was not able to guess which personality disorders Karpay was writing about, and so I could only enjoy the music from an aesthetic standpoint. The second movement was the most fascinating: Karpay and Snow performed slithering lines that were very similar, yet noticeably ajar. The tension persisted through the aid of close, crunchy intervals, and movement that was similar in pacing and motion, but rarely simultaneous. The third and final segment of the concert provided a glorious finale, beginning with my most anticipated tune of the night. Ashley Bathgate took the stage for “Light is Calling”, Michael Gordon’s classic ascending ballad made famous by Todd Reynolds on the album of the same name. As a Bang on a Can All-Star, Bathgate is hardly a stranger to Gordon’s music, and played this emotional gem with graceful animation. Her version was soft and subdued, contrasting the outwardly crying Reynolds recording with an introverted, contemplative take on the melody. This is another piece on the program I would love to have heard with a cello pickup instead of an SM57, as the electronics track eclipsed the acoustic sound a bit, though not as drastically as in “Empty City”. Bill Morrison’s accompanying film looked spectacular on the massive screen, too; this was one of the most gorgeous moments of Cellophilia. A fragile, polyrhythmic abyss was the opening texture, and out of it came momentary passionate melodies that broke through to the foreground, then just as quickly receded away again. Hansen achieved a really breathtaking tension by providing only brief moments of tonal or metric footing before allowing it slip back into the fidgeting, liquid texture, leaving the listener constantly feeling en route to somewhere. I adored the fragile, breakable sound of the cello’s sliding harmonics, which in the continuously ebbing abyss felt like melody in itself. The quote Hansen provided as the basis of the piece was instantly apparent in the music. Perhaps it resonated particularly close with me–since leaving the nest for college over six years ago, I have not lived in a single place for more than a fraction of a year. A semester abroad in Kyushu, and transplanting to New York shortly after returning to the states, “home” has been a very ambiguous concept in my life, and I long for pieces of all these places. Traveller painted this sentiment lucidly. Even as the piece blossomed into a full-bodied climax (one that I had been waiting for all night), the music never provided an opportunity for the listener to get too comfortable in one place. I was totally captivated until the cellists receded and I was snapped back into reality by the clicktrack, audible in the house from Hansen’s headphones. As if “Traveller” was not a profound enough experience to end a concert on, the full brigade returned to the stage for an ambitious finale: Steve Reich’s “Cello Counterpoint”, led by conductor Jeffrey Gavett. It was my first time seeing the piece played by an ensemble, rather than the often-preferred method of one soloist with seven prerecorded tracks. It was a powerful performance; the motor of the back row crisp, the interlocking counterpoint crystal clear, and Bathgate’s solo part vitalized with dance-like execution. W4’s Cellophilia achieved it’s goal of putting on a thrilling show while highlighting the cello’s versatility. Every piece on the show had something unique to offer. The one application of the cello that I felt was noticeably missing from an otherwise comprehensively diverse program was the instrument’s ability to be live-processed. With live-looping a widely practiced performance technique these days, and with the ease of the cello’s plug-and-play accessibility to this method of performance, I thought a piece for cello looped or processed through a DAW like Ableton Live would have rounded the gauntlet of cello-bility. But that’s just a nitpick. The bottom line is that W4 knows how to put on a recital of new classical music. EDITOR’S NOTE: Tim Hansen actually did use Ableton for his performance. Our sincerest apologies. This entry was posted in Avant Garde, Concert reviews, New Classical Music, Review and tagged Ashley Bathgate, Cellophilia, Mariel Roberts, Matt Frey, Robert Karpay, West 4th New Music Collective. Bookmark the permalink. So pleased to see this review, particularly as I was unable to get to this concert. The idea sounded inspired, and it appears the reality was, indeed, inspiring. I look forward to hearing more from W4NewMusic. So do I, I wish I’d been there!